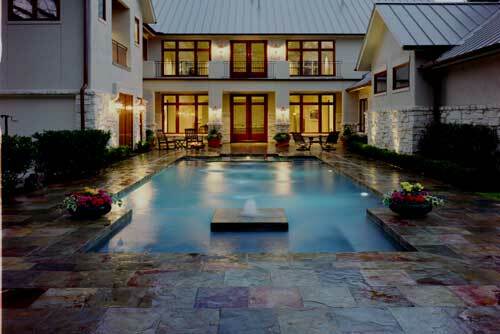 This dramatic party pool is a modified rectangle featuring an offset spa opposed by a floating bubbler fountain. The niche created by the bubbler fountain has a wrap around bench for ample seating and adds a sense of destination to the far end of the pool. The clean lines are preserved by a zero overhang slate coping that blends with the deck to maximize the visual spaciousness of the narrow space. Custom deck mounted brass pencil jets add a classic edge when spraying into the medium blue water.